As the start of another New Year begins we tend to hear everyone making the usual cliche New Years resolutions! Although I do have some personal ones of my own including improving my health (I've had chronic tonsillitis for 4 months) and building myself up again at the gym when I'm well enough. I decided I wanted to make some blog specific New Years resolutions. I thought writing them down and sharing them with you might mean I'm more likely to stick to them! 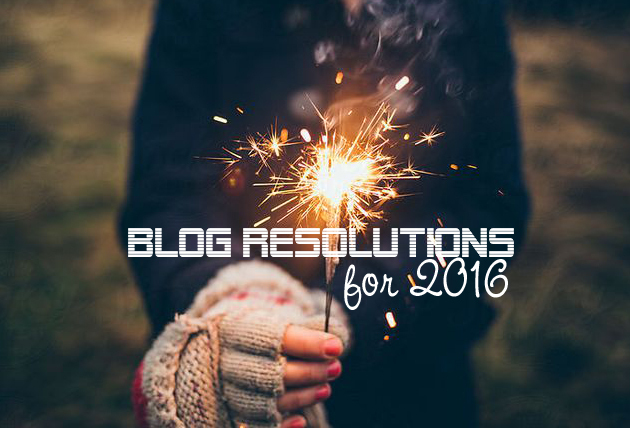 My blog is only 5 months old but it is one of the best things about 2015 for me. It is my very own little corner of the Internet and gives me an outlet to share, photograph and write about the things I love like life, crafting, makeup, beauty and personal style! 1. Write in my new blog planner/diary every week. I got a new one for Christmas from The Bloggers Planner so I reckon I'm going to keep all my ideas and plans in there! 2. Work my way through my (very) long list of blog post ideas! 3. Giveaway at 6 months! As mentioned above my blog was born on August the 1st which means that on February the 1st it will be 6 months old. I'm planning on holding a special giveaway to mark this. 4. I really enjoy how friendly the blogging community is and I would like to connect with more local bloggers and maybe organise a meet up - anyone live in Sussex, UK get in touch! 5. Connect with relevant fashion/beauty brands and hopefully get invited to and attend a few blogger events! 6. Schedule more posts and plan ahead! Up until now I haven't been very good at keeping to schedule with my blog, things seem to take a lot longer than I think they will. I hope to continue posting 2-3 blogs a week, we'll see if I can stick to that shall we?! 7. Keep striving for quality content - quality over quantity always! 9. Increase readership, comments and interest in my blog - hopefully by achieving the two points above. 10. Continue improving the quality and creativity of my photography by experimenting with new angles, displays and backdrops. 11. Make some more YouTube videos - I've only made 2 so far and found it very time consuming! 12. Enjoy it! This is the bottom line and why I started blogging in the first place. Love these resolutions! They're pretty similar to the ones I have for 2016. Accountability is definitely a good first step. Thanks Melissa! It's a rather nice feeing actually that all "us bloggers" are in the same boat.